Peanut Butter Cheesecake Squares – creamy peanut butter cheesecake, a crunchy Oreo cookie crust, and a milk chocolate topping with peanut butter cups. Basically EVERYTHING you need in a dessert! Last weekend I was craving peanut butter and it seemed like 1 million years since peanut butter deliciousness had graced my kitchen. (Well, more like 2 weeks – but that’s an eternity in my life). So – it was time to make something peanut buttery. And since the craving was a big one – there was no going halfsies. I was in need of a go big or go home type of peanut butter dessert. Enter: Peanut Butter Cheesecake Squares. Creamy, super smooth peanut butter cheesecake with an Oreo cookie crust. Then topped with milk chocolate & Reese’s peanut butter cups. They’re basically one big peanut butter cup in creamy cheesecake form. And better still, because we’re making our peanut butter cheesecake in a 9×13 inch pan – it serves a crowd. The recipe starts by making our Oreo cookie crust. A little butter and Oreo cookie crumbs are mixed together then pressed into the bottom of the prepared pan and baked. I like baking my cheesecake crust first because it makes for a crunchier base. Then to make the peanut butter cheesecake first we beat the cream cheese til it’s very soft. (Make sure your cream cheese is room temperature before getting started). Then we mix in the sugar, followed by the sour cream, peanut butter and vanilla. Lastly we mix in the eggs one at a time. After adding in the eggs, make sure not to over mix the cheesecake batter. Then it’s time to bake our cake. If you have a roasting pan that’s large enough for your 9×13 inch cheesecake pan to fit inside it, you can use the water bath method to bake your cheesecake. The water bath method really helps to ensure your cheesecake doesn’t crack, however it’ll mean your cheesecake needs longer to bake. I always recommend using the water bath method when possible, but I’ve included instructions for both baking methods. After the cheesecake is done baking, let it cool slowly to room temperature. I like to turn off the oven and open the oven door to do this. Then once it’s fully cooled to room temperature, let it chill in the fridge for at least 4 hours or preferable overnight. Chilling a cheesecake actually improves the flavor and texture for that luxurious, super creamy, perfectly dense cheesecake. Then when you’re ready to serve, each piece gets topped with melted chocolate and peanut butter cups. You could say the topping isn’t “necessary”, but I’ve never let that stop me when it comes to desserts! These Peanut Butter Cheesecake Squares are smooth & creamy with a crunchy Oreo cookie crust, and a milk chocolate topping with peanut butter cups. The perfect dessert for peanut butter lovers! Preheat the oven to 350F degrees. Line a 9x13 inch glass baking pan with aluminium foil and lightly grease with non-stick cooking spray or butter. Make the Oreo cookie crust. In a medium sized bowl, stir together the Oreo cookie crumbs and melted butter. Press mixture into the bottom of your prepared pan and so it covers the bottom and is tightly packed (I like to use the bottom of my measuring cup for this). Bake in the preheated oven for 8 minutes then remove. In a large bowl using a stand or hand-held electric mixer on medium speed, beat the cream cheese until well softened (about 3 minutes). Then add in the sugar and continue beating until evenly mixed and no lumps remain. Then turn the mixer to low speed and beat in the sour cream, vanilla and peanut butter. Make sure to turn off the mixer and scrape down the sides of the bowl as necessary. Finally beat in the eggs 1 at a time, being careful not to over beat the mixture after adding each egg. Then pour the mixture into your prepared pan. Then bake the cheesecake. For the water bath method, place the pan inside a large roasting pan and pour about 1 inch of hot water into the bottom of the roasting pan. Place the whole thing in the oven and bake for 50-60 minutes or until just the center of the cheesecake (a circle about 2 inches in diameter) has a slight wobble in the middle. Or if baking the non-water bath method, place the cake in the oven and bake for 40-50 minutes or until the center has just a slight wobble. Then turn off the oven and open the oven door about 6 inches. Allow the cheesecake to cool in the oven (turned off) for about an hour, then remove from the oven and continue cooling til it reaches room temperature. Cover the cheesecake pan and chill in the fridge for at least 4 hours or preferably overnight. In a small microwave safe bowl, microwave the chocolate in 30 second bursts stirring in between each until it melts. (Or use a double boiler). 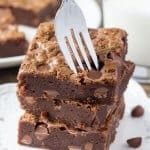 Cut the cheesecake into squares and top each with a spoonful of melted chocolate and a few chopped peanut butter cups. Yes. Yes to every little tiny bit of this. I am totally obsessing- and I know my whole family is going to, too! Oh! These bars just look perfect! Love the chocolate on top! Do you have to bake the Oreo crust or can you leave it just as is? You don’t necessarily have to – it just helps to keep the crust a little crunchier.